The Ooma DP1-O Wireless Desk Phone is a sleek, 2-line desktop phone with a powerful set of features designed to serve the needs of growing businesses. With DECT 6.0 technology built-in, this phone pairs wirelessly with an Ooma Office VoIP Base Station and will have you up and calling in minutes – no ethernet cabling or extra adapters needed. Yealink SIP-T23G makes it easy for people to interact and maximize productivity. Yealink HD technology enables rich, clear and life-like voice communications. As a cost-effective IP solution, it helps users to streamline business processes and deliver a powerful, secure and consistent communication experience for small and large office environments. It supports up to 6 simultaneous calls. It also has Dual-port Gigabit Ethernet with PoE (Power over Ethernet) support and a 132×64-pixel monochrome LCD with backlight showing a clear five-line data display. If you run a business with a high volume of business calls, this deluxe office IP phone has everything you’d ever want: superb sound quality, a rich visual experience, and easy-to-use features. 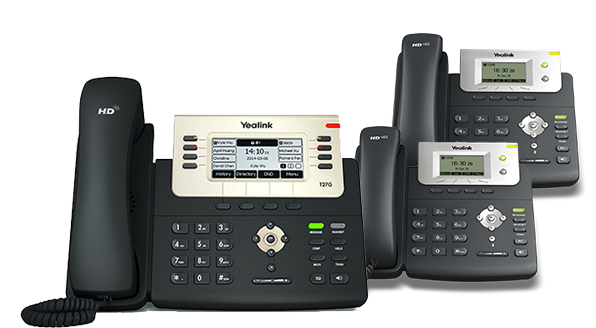 Each Yealink T27G comes with the following features: Exceptional voice quality from the handset and speaker, 6 lines for up to 12 simultaneous calls, dual-port Gigabit Ethernet with Power over Ethernet (PoE) support, 8-line, 3.66” 240×120-pixel graphical LCD with backlight, dual-color (red or green) illuminated LEDs for line status information, 8 physical programmable buttons, and up to 21 programmable buttons through “pagination,” 6 navigation buttons, 4 context-sensitive “soft buttons,” a stand with 2 adjustable angles, and an RJ-9 connector for optional headset. Power supply and ethernet cable included. Yealink’s SIP-T21P E2 takes entry-level IP phones to a new level. It has a 2-port Fast Ethernet switch with PoE (Power over Ethernet) support, an extra-large 132×64-pixel graphical LCD with backlight showing a clear 5-line data display, 2 line keys, 4 soft keys, and a RJ-9 connector for an optional headset. It supports up to 4 simultaneous calls. Cisco’s Small Business SPA 303 IP Phone features exceptional voice clarity and enhanced speaker quality. It has a 2-port Fast Ethernet switch, a monochrome LCD display, 3 line keys, 4 soft keys, and a 2.5 mm jack connector for an optional headset. It supports up to 6 simultaneous calls. Cisco’s Small Business SPA 504G IP Phone offers great voice clarity and call quality for large and small businesses alike. It has a 2-port Fast Ethernet switch with PoE (Power over Ethernet) support, a monochrome LCD display with backlight, 4 line keys, 4 soft keys, and a 2.5 mm jack connector for an optional headset. It supports up to 8 simultaneous calls. Enjoy echo-cancelling technology with a sleek user interface. Designed for small and medium-sized conference rooms, this phone also enables a full-duplex speakerphone. The CP920 strikes a perfect balance between ease-of-use and powerful features. Power supply and ethernet cable are included. Other features include: built-in wifi and Bluetooth, background noise suppression, 3-microphone array, backlit LCD display, a sensitive touch keypad, and a 20-ft, 360-degree voice pickup range. Perfect for employees on the move, this phone combines portability and call management capabilities with a sleek design. Other features include: a high-quality speakerphone, up to 30 hours of talk time and 400 hours of standby time, a range up to 50m indoors/300m outdoors, supports 2 simultaneous calls, a 3.5mm headset jack, and a color screen with an intuitive interface. This cordless phone delivers a perfect balance of mobility and call management. The phone comes equipped with a Yealink W60B base unit and one Yealink W56H handset. The base unit can support up to 7 additional Yealink W56H handsets – perfect for growing businesses. Base unit features include: wireless DECT 6.0 technology, ethernet support, power supply, and an ethernet cable. W56H handset features include: supports 2 simultaneous calls, a high-quality speakerphone, a 3.5mm headset jack, up to 30 hours of talk time and 400 hours of standby time, a 50m indoor/300m outdoor range, and a color screen with an intuitive interface. If you’re managing a large amount of business calls on a regular basis, this expansion module is the perfect user-friendly addition to the Yealink T27G IP phone. The device includes 20 additional dual-color programmable buttons that support essential calling functions like speed dialing and call parking. Each expansion module comes with the following features, functions and add-ons: 20 dual-color, LED programmable buttons; 160 x 320 graphic LCD with backlight; icons to visualize features like call parking or speed dialing; and a stand with two adjustable angles. Additional info: This device is compatible with the Yealink T27G IP phone. The Yealink EXP20 cannot operate on its own and must be connected to this phone to function. Up to two EXP20 Expansion Modules can be powered directly by the Yealink T27G. A power supply (ordered separately) is required if using more than two EXP20 modules. The Ooma Linx uses DECT 6.0 technology to wirelessly connect additional telephones or fax machines to the Ooma Office Base Station. Connect up to 4 Ooma Linx devices to each Base Station. The Ooma Expansion Base Unit adds capacity to your Ooma Office system. Ooma Office can support up to four expansion Base Stations and a total of 20 analog phones. Expansion Base Stations do not come with Linx devices, so these must be purchased separately.